Notes from A Cottage Industry: I was Green before green was cool, people. I was Green before green was cool, people. ...and I know lots of you were too....Her, for example. And her. And her. Oh! and of course, her. Green....Um, ya. You know, renew, reuse, recycle. Recycle. That's what we nutty and obsessed serious yard saling, junker types do. (I wonder if we junkers could be LEED certified?) We re-purpose discarded items, skillfully size up what may appear to the untrained eye to be trash, unearthing a real diamond in the rough. Such was the case this past weekend. 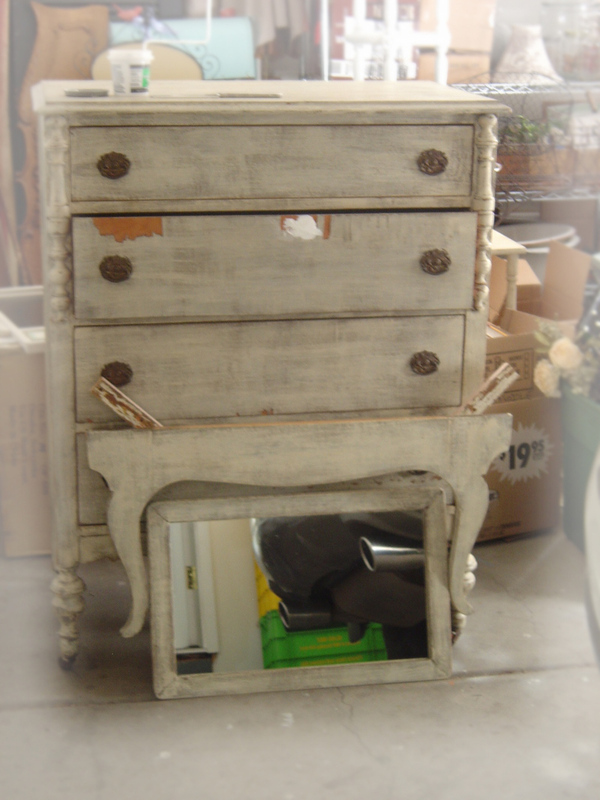 I spotted this fabulous antique dresser on craigslist last Friday and emailed the guy. We set up a time after the writer's conference on Saturday for me to go take a look. Can you see the inner beauty? Look close. It has the original wooden wheels (like those last 2 chairs I bought!) It is so darned cute. So perfect. I got it for a great price, and after a little bit of repair work on the drawers I will work my painter's magic on it. Once it's done I can enjoy the cuteness of it and be proud of myself at the same time. After all, I saved it from an everlasting life in the landfill.